There are 27 countries covered by CAP. They hold approximately 14 million farmers. The farming and food sectors together provide 7 % of all jobs and generate 6 % of European gross domestic product. Through CAP, EU provides incentives to farmers to work in a sustainable and environmentally-friendly manner. While it looks good on paper, to farmers it shows as a huge load of bureaucracy and complicated details. 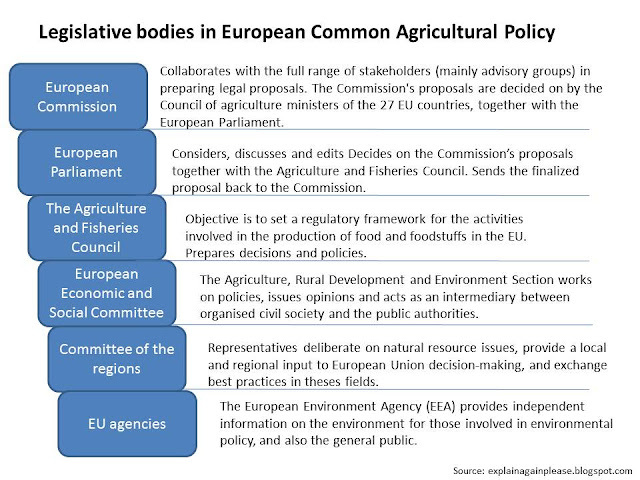 The monetary support from EU to farmers is divided into global and local subsidies, which must be applied for separately, with separate forms and separate rules to follow. Plans, follow-ups and reports must be made to prove that the rules have been followed. A whole industry of advicing farmers with the bureaucracy has sprung up. But when governmental subsidies are almost half of the income of a farmer (who sometimes can barely afford a minimum salary to himself), the monetary support is clearly vital for European agriculture. Below is a short diagram showing how the CAP is maintained. European Commission is the highest authority, and draws the strategic lines for the whole EU area. EU agencies and the local agencies under it are last on the hierarcy, supporting the legislative and authoritative bodies in their respective countries.